Copyright: � 2011 Karayanidis, Whitson, Heathcote and Michie. Task-switching paradigms produce a highly consistent age-related increase in mixing cost [longer response time (RT) on repeat trials in mixed-task than single-task blocks] but a less consistent age effect on switch cost (longer RT on switch than repeat trials in mixed-task blocks). 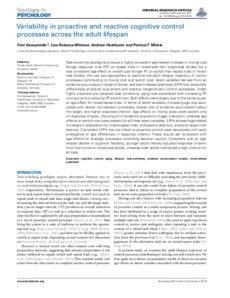 We use two approaches to examine the adult lifespan trajectory of control processes contributing to mixing cost and switch cost: latent variables derived from an evidence accumulation model of choice, and event-related potentials (ERP) that temporally differentiate proactive (cue-driven) and reactive (target-driven) control processes. Under highly practiced and prepared task conditions, aging was associated with increasing RT mixing cost but reducing RT switch cost. Both effects were largely due to the same cause: an age effect for mixed-repeat trials. In terms of latent variables, increasing age was associated with slower non-decision processes, slower rate of evidence accumulation about the target, and higher response criterion. Age effects on mixing costs were evident only on response criterion, the amount of evidence required to trigger a decision, whereas age effects on switch cost were present for all three latent variables. ERPs showed age-related increases in preparation for mixed-repeat trials, anticipatory attention, and post-target interference. Cue-locked ERPs that are linked to proactive control were associated with early emergence of age differences in response criterion. These results are consistent with age effects on strategic processes controlling decision caution. Consistent with an age-related decline in cognitive flexibility, younger adults flexibly adjusted response criterion from trial-to-trial on mixed-task blocks, whereas older adults maintained a high criterion for all trials.